Jamie Brennan finished the game with three from play. 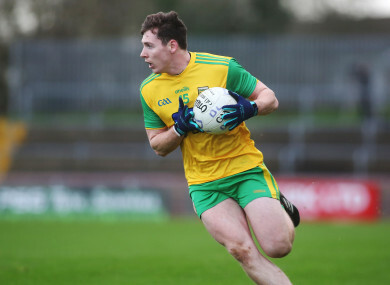 DONEGAL HAD TO withstand a staunch Clare effort before picking up the opening two points of the Allianz National Football League Division Two. Michael Langan opened the scoring with a free he had won himself, but Clare struck back to take the lead for the only time in the first half with points from Gary Brennan and a Keelan Sexton free. Sexton had a goal chance soon after but dragged his shot wide on the left after racing in from the right wing. This seemed to spark Donegal into life, and they hit four in a row with a brace from Ciaran Thompson along with points from Langan and Eoghan Bán Gallagher to leave them 0-5 to 0-2 in front after the opening ten minutes. Dean Ryan and Jamie Malone combined to good effect with Ryan applying the finish to cut the gap to two, but indiscipline in the Clare defence presented Langan with a chance to finish another free which he duly converted. The best score of the opening half came soon after as Banner captain Gary Brennan went right through the heart of the Donegal defence to split the posts, but Langan landed another free to keep his side at arm’s length by 0-7 to 0-4 with 15 minutes to go to the break. Clare then struck two in a row through Dermot Coughlan and David Tubridy to leave just the minimum between them, with Donegal replying Jamie Brennan with a tidy finish from a tight angle. Another brace for the home side through David Tubridy kept the pressure on Donegal, but they could not get back on level terms. A quick fire double before the break through Jason McGee and Niall O’Donnell saw Donegal in front by 0-10 to 0-8 as they headed for the dressing rooms. Clare hit the opening three points of the second period with Tubridy (2) and Brennan on target to send them into the lead, but Donegal were quick to reply with four in a row thanks to a brace from Jamie Brennan along with a McGonagle free and a fine effort from McGee. That left the Ulster men 0-14 to 0-11 clear inside the closing ten minutes. Gary Brennan and Gavin Cooney split the posts to leave just the minimum between them as the game approached injury time, but Hugh McFadden and McGee notched over scores to see the Donegal men leave Ennis with both points. Scorers for Clare: David Tubridy (0-6, 3f), Gary Brennan (0-3), Dermot Coughlan (0-1), Dean Ryan (0-1), Keelan Sexton (0-1, 1f), Gavin Cooney (0-1). Email “Missing a host of regulars, Donegal come away from Clare with victory”. Feedback on “Missing a host of regulars, Donegal come away from Clare with victory”.